The classic roll-top drybag design of the Ortlieb Front-Roller, but in rugged Cordura fabric for lightweight, waterproof performance on extended treks. 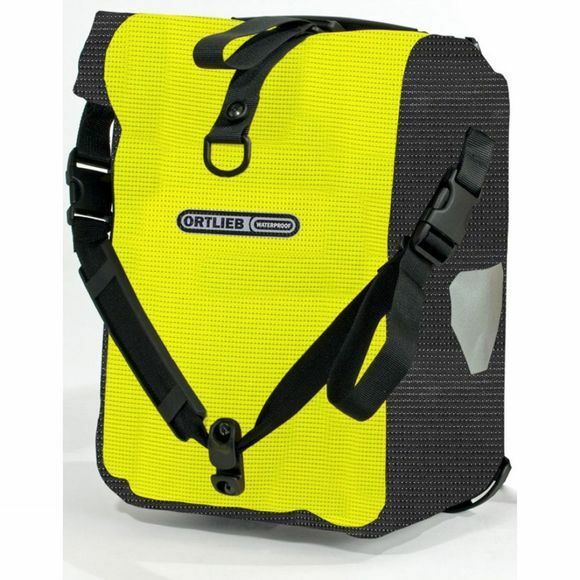 These smaller panniers are ideal for front rack use, but also make excellent rear mounted bags for smaller loads. As well as being obviously fluorescent, the fabric of the bag is woven with reflective thread for excellent night-time visibility too. In addition, these Hi-Viz Back-Rollers mount to your rack using the QL2.1 system: simply drop the hooks into place and they fasten. When you lift the carrying handle, it releases and lifts cleanly away. If you're moving between bikes then you'll appreciate the anti-scratch design too, as well as the tool-free adjustment: everything can by positioned by hand.